How does the bladder transition from releasing urine at night to being able to hold urine at night? I wonder about this. What's the biology of the transition from wetting the bed at night to holding urine at night? Is there a chemical change with how the bladder muscles contract? It can happen that this daily cycle of ADH release intensity gets out of adjustment and you urinate more frequently at night, perhaps more than in the day. This has happened to me. Also, according to my GP, it is a frequent cause of bed wetting in children. The bladder is controlled by both the autonomic and somatic nervous systems. 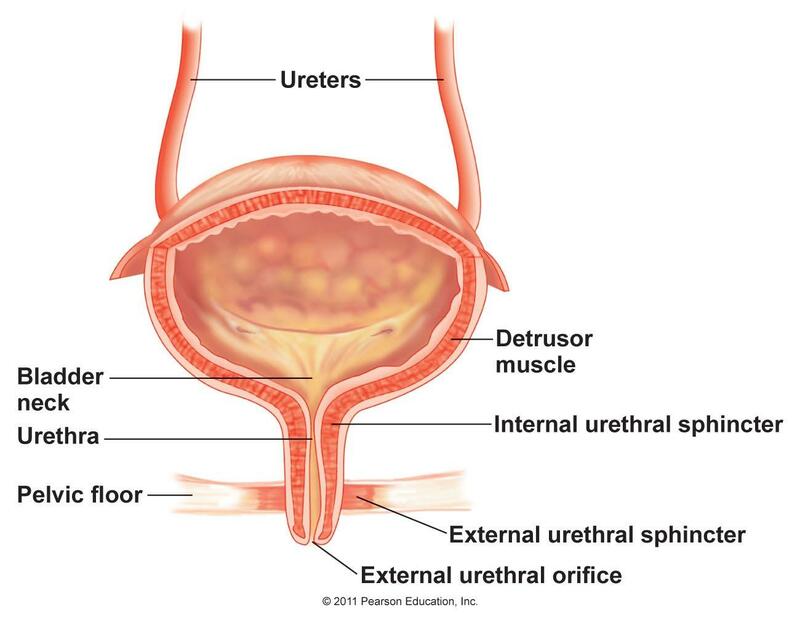 This means that part of the bladder activity is voluntary and another part is involuntary - more precisely, the detrusor (which is the smooth muscle in the bladder wall) is controlled involuntarily, while the external sphincter (the muscle around the bladder neck) is controlled voluntarily (see picture, this is the female bladder). The bladder capacity must increase. The child must develop voluntary control over the sphincter muscle in order to start and stop voiding. the child must develop voluntary control over the infantile voiding reflex which allows the child to stop involuntary bladder contractions. This article discusses the topic of bladder maturation in greater detail (see the first section titled: MATURATION OF BLADDER CONTINENCE). From the article: "As bladder urine increases, a critical volume is reached (functional bladder capacity), which initiates a spontaneous reflex contraction that is mediated by the sacrospinal ganglia. As the bladder contraction ensues, the increased bladder pressure overcomes the detrusor muscles at the bladder neck and spontaneous emptying occurs. As the infant grows and matures, control centres in the pons and medulla initiate inhibitory signals that slowly dampen this reflex over a period of years ... Nighttime continence is achieved in association with the abolition of spontaneous bladder contractions, mediated by the pons and medulla; a nocturnal bladder volume less than the nocturnal functional bladder capacity (NFBC), which is ADH-dependent; and the achievement of prolonged rapid eye movement (REM) sleep and attainment of sleep arousal." Not the answer you're looking for? Browse other questions tagged human-physiology organs or ask your own question. Effects of HRT on transgender(M to F) physiology and athleticism.